Justin’s class is dismissed at 11:30am. Before, I just fetch him from school and we go straight home. This allows me more time to do administrative tasks or work on a writing assignment. I realized, however, that I have been depriving my son of more playtime with his classmates and friends after class. That made me really guilty. I have resolved to give him more time after school every day to play in their school playground. He is particularly fond of the sandbox. That’s my son with his current favorite classmate/friend Maxine. This photo was taken last Friday when they celebrated Chinese New Year in school and they had to wear Chinese costume. 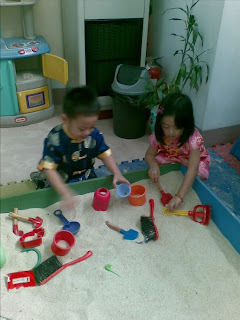 This entry was posted in Musings, Nursery, Personal, Playtime, School. Bookmark the permalink. Tetcha, don't worry, you are not the only one guilty; i am too :-); just like you i am trying to give more time playing with my son as well as taking him to the playground when the weather permits. Mukhang nag enjoy talaga ang son mo playing with his classmate & i'm sure he appreciates you letting him play.They look cute with their Chinese outfit as well :D.God Bless!